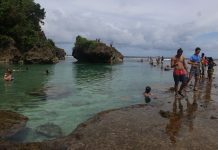 HINATUAN, Surigao del Sur – What was once an ordinary log pond at the height of the logging operations in Surigao del Sur in the 1950s is now one of the top tourist destinations in the province. With its cool crystal-clear water, the “Enchanted River” is one of the must-visit natural resorts of this rustic town and it has been drawing foreign and local tourists alike even before it was fully developed two years ago. From the town proper, a 14-kilometer narrow dirt road leads to the natural spring resort nestled at Barangay Cambatong. Single motorcycles, locally known as habal-habal, carry passengers from the town proper to the resort for P40. Ernesto Dungque, one of the resort workers, tells MindaNews that what is now the swimming area used to be a log pond. He adds that a few logs still lie submerged at the bottom of the 26-meter deep natural pool. A native of the barangay himself, Dungque recalls that some 15 years back it was just an ordinary natural spring where local villagers would occasionally gather and swim. 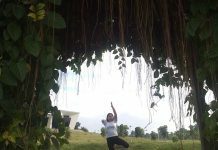 “When you just pass by the road, you would not really notice that there is a natural spring in here because this was still covered by thick forest and giant balete trees,” the resort worker, who is now in his mid-40s, adds. Asked why it’s called “Enchanted River,” Dungque can’t exactly explain but he believes that it is because of the stories that engkantos (supernatural creatures) have been seen in the area. “Pero dugay na to. Daghan mga istorya dire na naay mga gapa-ramdam na dili pareha sa atua. Pero wala na karon, daghan naman tao. Siguro nadawat na nila” (But that was a long time ago. Stories abound that they make their presence felt here. But that’s no longer the case, as many people have been coming here. Maybe they have accepted that). And just two years ago, the local government decided to build huts and install beach umbrellas a few meters away from the river. A wooden foot bridge also leads to the docking area for motorized bancas, which ferry tourists to the nearby island and beach resort for P150 an hour. Concrete stairways have been built leading to the children’s pool and to the bluish natural pool. Gatekeepers collect an entrance fee of P20 and cottages are available at P100. Since the pool is quite deep, they require those who don’t know how to swim to wear lifejackets which are for rent at P100 each for a whole day use. But lifeguards are always on their stations to keep an eye on the excursionists. Kids may also swim at the knee-deep pond beside the larger pond and at the shallow portion of the river, just a few meters away from bluish waters. During high tide, sea water flows back into the river and makes the water brackish. From the head spring, the river flows 600 meters into the coastline of Hinatuan Bay, which is facing the Pacific Ocean. Just across the road, a row of stalls serve newly cooked sea foods at very affordable prices. You can enjoy a plateful of squid for just P100 and another plate of grilled fish for P50 to P100. But mind you, the vendors don’t serve pork or beef. The tourists, one vendor said, must enjoy the fresh sea foods from this town since pork or any meat can be readily had back in their hometowns. At 12 o’clock noon, the bell rings and swimmers are asked to vacate the river since it is feeding time for the fish. After ringing the bell, a resort worker would come down beside the pond and throw away leftovers of rice, shrimps, bread and other food. This lasts an hour during which no one is allowed to swim in the river. During Christmas season and summer, tourists would reach as many as 500 persons per day, a number too big for the resort to accommodate. But Dungque says that some would just wait outside until a group would leave. “There are times that some would just leave and go to nearby beach resorts,” he says adding that some would even hold parties and meetings in the resort. But unlike in nearby beach resorts, overnight stay is not allowed as the resort closes at 5p.m. Bringing videoke machine and playing loud music is prohibited. However, those who have visited the Enchanted River before it was transformed into a commercial resort say they still prefer the natural look of the river. In the past, tourists had to cling to rocks and roots when going down to the river. “Nothing beats the natural beauty of this river in the past. You could really enjoy the rejuvenating beauty of the environment,” a local tourist said. 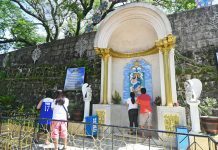 “Nawala na hinuon pagka-enchanted kay daghan naman tao permi” (The enchantment has been lost due to the influx of many people).